Here we are at the end of another ski season and while this season has been one for the record books many of us up here in Breckenridge are starting to pine for the return of summer. For many, summer means getting out the bikes and getting some miles under the tires. 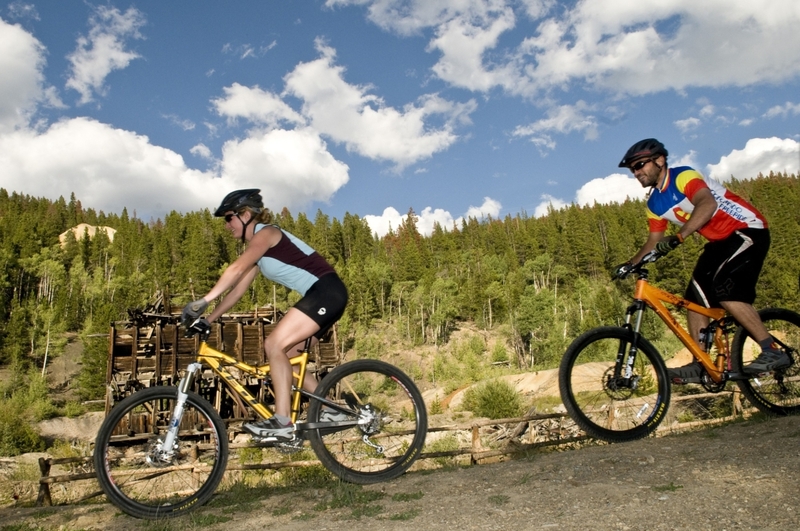 Breckenridge and Summit County are known as world-class mountain biking destinations. Seemingly endless miles and a variety of trails cross the area offering excitement and challenges to riders of all levels. This spring, based on the huge snow total Breckenridge has received, the trails will dry out a little later than they have over the last few years. It will be June before all the trails are dry but if you are planning a trip to Breckenridge this spring here are a few ideas for some early season rides. Remember to ride on dry trails as riding on muddy conditions will deteriorate the trails. Summit County is already plowing and cleaning the rec path system and decent sized sections are already clear. The rec path will be cleared and rideable before any dirt trail. The rec path is a perfect way to get your legs back in riding shape. Here are a few suggestions for some early season rec path rides. The Breckenridge bike path is generally flat with some moderate hills. Take this path 1.5 miles from the Breckenridge Recreation Center and back or take the path 10 miles all the way to the neighboring town of Frisco. This is a paved path making it perfect for trail, cruiser’s and road bikes alike. Take your ride up a notch and go from Breckenridge all the way to Keystone. Take the Breckenridge Bike Path north towards Frisco and when you reach Swan Mountain Road head right up the road (there is a bike lane on the right) which then takes you into the neighborhood of Summit Cove. This scenic ride is a great way to get the blood flowing and the legs ready for some summer bike rides! This trail is better for more experienced riders as it does include a significant climb. This trail goes through Dillon, Frisco and Breckenridge and is about 31 miles round-trip from Breckenridge. This route includes both the Breckenridge bike path and Swan Mountain Road sections and includes a couple of steep climbs. The views are amazing and biking around the lake is a great way to see the county. The Oro Grande Trail is a 4 mile stretch of old forest service road in Dillon that parallels Tenderfoot Mountain’s south facing slope and is one of the first trails in Summit County to dry out. Oro Grande is a fairly easy ride and is good for the whole family. Access is from Summit County Road 51 in Dillon. The trailhead is above a water tank on the south side of the road. Follow the trail east and at about 2 miles you will come to a four-way intersection. The trail continues straight ahead (east). After a climb and descent there is a fork in the trail. Take the left fork towards a climbing switchback. Top out and descend to the Summit County Landfill road (CR 66) near the Summit Shooting Range. The Carter Park trail system will start to open as large sections of these trails are lower in elevation and south facing. These trails are an interconnect set of single-track trails that go all around the south east side of Breckenridge and beyond. These trails are well signed, and it is easy to navigate around this area. Carter Park is located at the south end of High Street in the southeastern corner of Breckenridge. The trail begins at the eastern end of the parking lot north of the tennis courts. The trail climbs briefly to a flume, then runs south to and intersects with the Sunbeam Trail at which point the trail climbs left to Hermit Placer flume trail. Take a little time and explore the options as there are various trails that cross the Carter Park trail system. 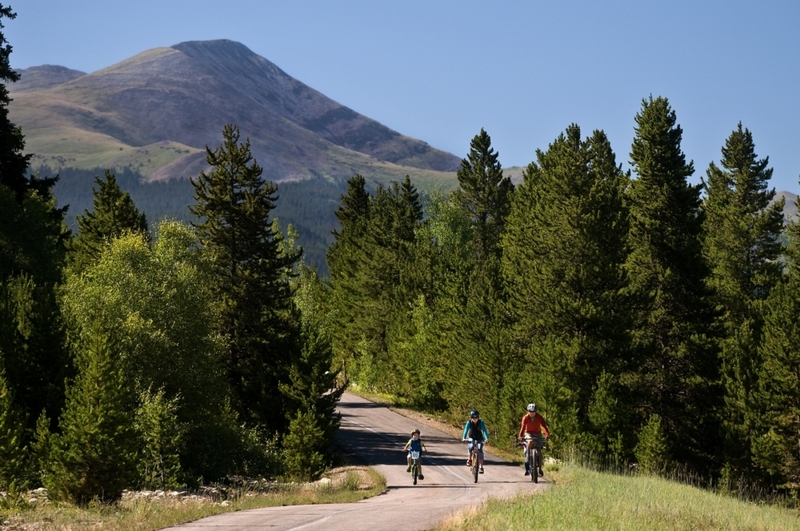 As spring in Breckenridge gives way to summer, hundreds of miles of trails open and Breckenridge transforms into the perfect base camp for mountain biking adventurers of all types. So, come for a visit this spring and summer and don’t forget your bike gear! If you are visiting and can’t bring you bike and gear no worries! Visit Breck Sports to set up your Bike rental and leave it to the experts to get you set up. With online booking and convenient pickup in Breckenridge or on Peak 8 you can’t go wrong with Breck Sports! Click here for more information.